Our life at Sir Arthur Currie continues to be daily celebrations of “firsts”. This past week was no exception as we finally opened our gymnasium and came together for the first time as a school community. Our charge custodian, Mrs. Comeau, did the honours as she cut the customary ribbon and officially deemed it “Open”. We also conducted our first Remembrance Day Service, which came together beautifully as a result of a full team effort. Our cross was built and painted, our choir filled the auditorium with beautiful music, our primary classes sang songs and recited poems and our junior students courageously shared poems they crafted themselves. When your school’s namesake is a famous WW1 General, there is an unspoken expectation that Remembrance Day becomes more significant. Our service started with a slide show highlighting Sir Arthur Currie’s life and contributions. Having Sir Arthur Currie’s great grandson in the audience made the service more meaningful for all of us. As the last post was played, Corporal Arthur Currie (Sir Arthur’s great grandson) saluted the cross adorned with wreaths. He was moved as many of our young students saluted him back. Following the ceremony, we toured the classes and our students were thrilled to meet Sir Arthur Currie’s great grandson. He was besieged with a number of students who wanted his autograph. His daughter, Lucy, couldn’t quite understand why a group of school children would want her daddy’s autograph. 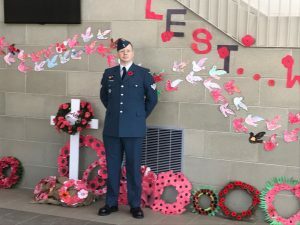 As the children inundated Corporal Currie with questions about his uniform and the Service, he spoke of men and women heading overseas to fight in wars ~ at which point, his daughter Lucy, spoke up and said, “But not you, right, Daddy?”. 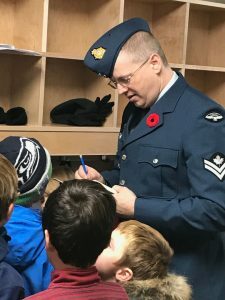 It was at that moment that it hit me ~ the true meaning of why we ensure that each year, in each school, we take the time to teach our students about the importance of Remembrance Day. We honour those who lost their lives in battles, who never had the chance to return to their children. We honour those who are currently fighting battles, who pray each day that they will be able to return to their children. But more importantly we focus on Peace in the hopes that our children will never know the pain of loss of a parent as a result of war.